This wildly world-popular comic series about secret wars between clans of ancient, mythic were-animals is collected for the first time in a new hardcover edition containing the entire first cycle of the series in a single gorgeous volume. Teenager Angel Tomassini has been hiding a dark and scary secret: when threatened he involuntarily turns into a violent and vicious were-tiger. He doesn’t know why, how, or what to do, because when he transforms, he loses control and people end up badly hurt. As if this isn’t enough for a kid to deal with, Angel is slowly learning his father is one of the biggest organized crime leaders in the city. And there are more were-animals like Angel and different creatures too. The high school changes Angel Tomassini experiences are unlike anything his peers can identify with! This series blends the thrills and excitement of a dozen different genres, from supernatural monster battles to inner-city organized crime, evolving in style as the series progresses. As young Angel matures, learning to live with his new found abilities, so too does the drama, with a gradual, exciting shift from High School fantasy to gangland conspiracy to a lone-wolf tale of survival. The epic nature of this thrilling universe is filled with mysteries that unfold piece by piece over time, drawing Angel deeper into an age-old war between the various “Dizhi” — powerful spirits based on an ancient collection of totems that can possess and empower those deemed worthy. 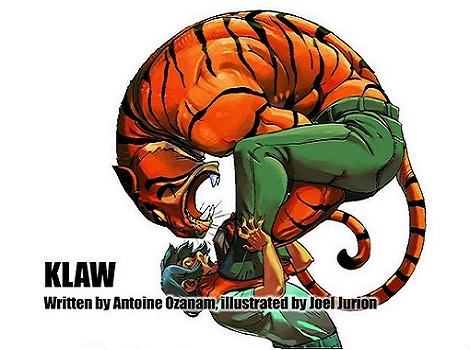 Klaw is written by Antoine Ozanam and Illustrated by Joël Jurion. This is the debut work from animation and game industry designer and celebrated artist Jurion who is already set to make a huge splash in mainstream comics. Presented in a high quality hard cover with curved corners and spot glossed elements, release date May 2016.